We are constantly striving to enhance the fan experience by adopting new technology, and this relationship with Pogoseat helps provide our fans another extremely convenient way to secure tickets. 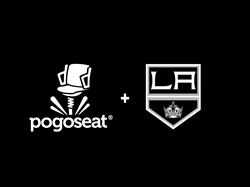 The Los Angeles Kings have announced a new and innovative partnership with Pogoseat® which helps provide Kings fans with a new and simple way to transact tickets for Kings home games at STAPLES Center. In partnering with Pogoseat, the Kings now have the capability to sell tickets via text message. Fans can sign up to receive text-ticket offers by visiting http://LAKings.com/texttobuy and will then receive text alerts when seats become available for games. Purchasing a ticket via text is fast and easy — once an offer is sent, fans can respond with the quantity of tickets they want and will receive seat options. Once they find the seats they want, they simply text “BUY” and the tickets are delivered to their Flash Seats account. The text to buy option is available starting today, Cyber Monday. To launch the program, the Kings are offering a $40 account credit to all fans who sign up today (Cyber Monday). Enter reward code “cyber40” on sign up. Pogoseat is partnered with AEG, the parent company of the Kings, and has worked closely with the AXS team to integrate with their ticketing system. On the whole Pogoseat has partnered with numerous major entertainment properties worldwide to help them sell more tickets and thrill fans. For all Kings ticket information call 888-KINGS-LA and visit LAKings.com. Pogoseat is an enterprise solution for sports teams and live-entertainment venues that enables their fans to purchase tickets, upgrade seats and discover unique VIP experiences before and during events. Pogoseat’s mobile application allows fans to improve their live entertainment experience and provides teams & venues a platform to increase fan engagement, monetize unused inventory and gather data that can be used to enhance the fan experience and sell additional tickets.